Quite the lose cannon, the Irish Terrier is a dog that is not very shy at all. They tend to be on the independent side and their stubborn nature can be a challenge when asked to do something they have no desire to conform to. Their aggressive actions generally are directed toward other animals such as other dogs and they are not exactly aggressive around strangers that may enter their environments, they are more aloof and stand off with them instead. Natural hunters that love to run and explore, the Irish Terrier will require some attention be that in the form of mental stimulation or physical as they can get bored rather quickly. They are energetic and very playful as well. This dog is has a mind that is constantly running. The Irish Terrier is very active and desires a lot of play. They are a great fit for a runner or someone that enjoys walking on a daily basis. They are exceptional watchdogs that also have the skills to be a great protector as well. They can adapt to any climate or temperature range. Training the ears is something the owner may want to peruse along with the advice of their vet as well as grooming requirements. They tend to have a common wire fur coat that will need some attention paid by brushing it and even shaping it during the year to keep it clean. The Irish Terrier is a very low maintenance type of dog. They tend to not require very much from their owners other than some physical stimulation. As they age they are one of the few breeds that do not develop many major health concerns. They can develop urinary stones which can easily be treated with antibiotics and any other treatments the vet may recommend if your Terrier develops them frequently. Other than that they generally live from twelve to fifteen years long which is long for a family pet, making them a great choice for a family with little children seeking a dog that can grow along with them. The Irish Terrier was obviously bred originally in Ireland, sometime the 17th century. experts believe they have been created by a cross breeding with a Black and Tan Terrier and one that was known as a wheaten-colored Terrier. Known for hunting anything from foxes to otters to small vermin, they became a canine of choice for hunters in the Ireland area. They have their own style and appearance that sets them apart from other Terriers such as having a longer torso and legs than the others. They grew as show dogs after the middle of the 18th century and by the end of that century they were ranked as the fourth most popular canine in England. There was some controversy when they were banned from cropping their ears in the late 1880's. From the 1920's and up they were popular in the United States and still are to this day. 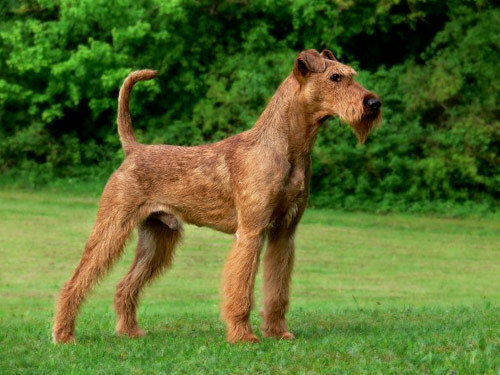 They have also been referred to as the Irish Red Terrier.